If you like chocolate in your chocolate chip cookies, then these are the cookies for you. These are absolutely full of choc chips and m&m's. They are soft to bite into, which I love, but the ends have a crunch also, which I love. The cookies keep their shape well when baked and are nice and thick and large. For me a really, really good cookie. The instant pudding mix I use quite often in other recipes, I am not sure what it does here in a cookie, but it works. So I will do it again, and again, and again. What is very important in this recipe is refrigerating the biscuits dough before baking. The dough must be chilled for two hours before baking so that they don't spread and be thin like pancakes when baked. If you don't have a freestanding mixer, you can make these using a hand held mixer. I doubled the mixture and the cookies worked perfectly. Use the large bowl of your free standing mixer, and the paddle attachment. Add the butter, brown sugar, caster sugar, egg and vanilla to the bowl. Beat on medium-high speed for about 4 minutes or until well combined. Remove your bowl from the mixer stand, scrape the sides of the bowl. Add the flour, pudding mix, bicarbonate of soda and salt. Mix it in with a metal spoon until just combined. Add the chocolate chips and the M&M's (not the extra M&M's), mix it in until the are well mixed in. Using your hands form 12 equal sized cookies. Roll into balls, place in a baking paper lined container, flatten slightly. 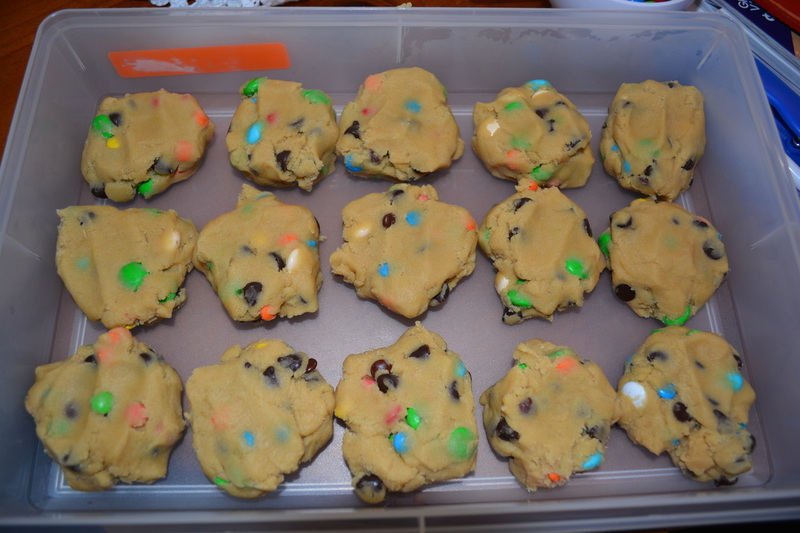 Using the extra M&M's, add them evenly to the tops of each slightly flattened cookie. Cover the container with a lid or with cling film, refrigerate for at least 2 hours. Preheat your oven to 175C. Line a baking tray with baking paper. Place the cookies on the prepared baking tray, leave space for them to spread, I usually bake 6 at a time. Bake for 15-20 minutes, depending on the size, mine were large so I baked them for 20 minutes. The edges need to have set and the tops just set and golden. Allow to cool on the tray for 5-10 minutes, then place on a wire rack to cool completely where they will continue to firm up. Keep baking the remainder or leave them in the refrigerator for up to 5 days, and bake fresh when needed.